Located on cobblestoned Bond Street and designed by Selldorf Architects, 10 Bond comprises nine two- to three-bedroom residences along with one discreet garden townhouse with private garage and one lushly landscaped penthouse that epitomizes indoor-outdoor living. Warmly modern elements and rich textures create a strong six-story façade of molded terra cotta pilasters marked by steel-framed casement windows in pleasing classical proportions. A highly unique exterior shade system enhances privacy for all residences. The glass-enclosed penthouse is shaded by a weathered steel and mahogany brise-soleil to enhance comfort, framing dramatic city views. 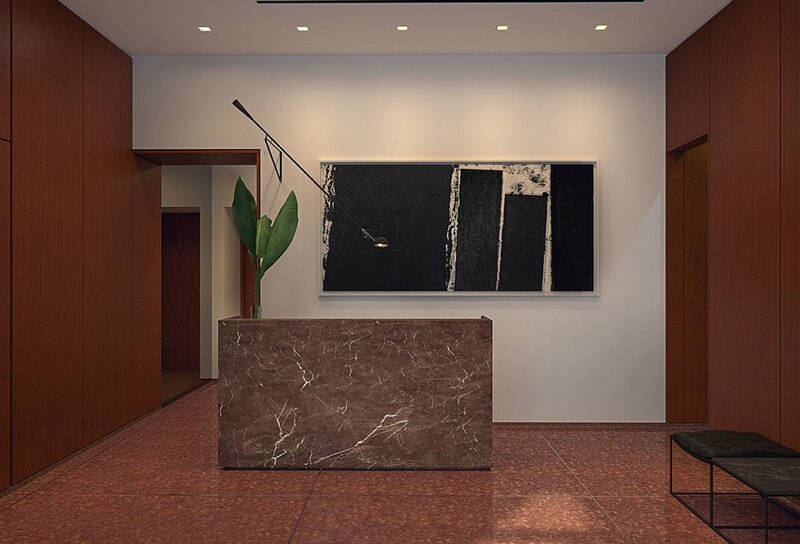 Residents enter the intimate lobby, attended by a full-time concierge, which features custom tinted terrazzo floors, rich mahogany panels, and a custom Selldorf-designed Rojo Alicante marble slab concierge desk. Each residence has direct elevator entry with a secure electronic key fob while the townhouse boasts a private entrance in addition to lobby. Amenities include a landscaped sunken garden courtyard as well as a fitness center with garden views. Residences enjoy soaring finished ceiling heights of 10’-10” while the townhouse features a thirteen-foot ceiling on its entertaining level. 8’-4” casement windows provide exceptional light. Fine finishes include wide plank Douglas fir flooring in a matte finish, solid-core painted wood doors with polished chrome hardware designed by Selldorf Architects for Via, and mahogany window sills. The penthouse and townhouse residences offer large-scale outdoor entertaining terraces thoughtfully planted by M. Paul Friedberg and Partners with full outdoor kitchens including sinks, refrigeration and barbeques. Kitchens are gracefully modern with a natural warmth: custom matte gray and white gloss Italian millwork, Bardiglio Nuvolate marble slab countertops, off-white hand-cast Delft tile backsplash and appliances by Miele, Wolf, Gaggenau, and Subzero. Windowed master baths are filled with natural light and are finished with honed Striato marble slab walls and radiant heated slab floors, a Glacier white Corian countertop, mahogany custom vanity millwork, and a custom free-standing solid surface bathtub. The complete offering terms are in an offering plan available from the Sponsor. File No. C13-0005. Equal Housing Opportunity.